This abbreviated version of ‘Kiwis Abroad’ covers off the four games played on New Years Eve that featured New Zealand players and the quartet all had cause to celebrate the New Year in style as their teams closed 2014 with victories. Isaac Fotu played a game high 29 minutes to help La Bruixa d’Or Manresa secure their third win in four outings, outlasting Sevilla 80-72, in the Spanish League. Fotu contributed 10 points, including 2 from 5 triples, also adding 3 rebounds and 2 assists. Manresa enjoyed a dominant final quarter restricting the hosts to just 10 points as they extended a two points advantage into an 8 points victory. The game, played on January 30th (New Years Day morning, NZ time), boosts Manresa’s record to 4-10 and next up they host Zaragoza the club that has loaned Fotu out on a one-season deal to Manresa. That game is to be played on January 4th. BJ Anthony and Leon Henry were both involved in cliffhangers in the ANBL. 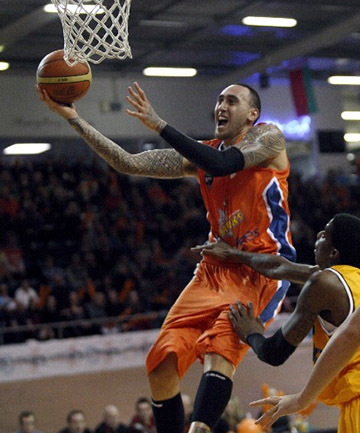 Anthony’s Adelaide 36ers visited Cairns Taipans in a game that was eventually won in overtime 84-77 by the 36ers. Cairns import Scotty Wilbekin tied proceedings at 72 apiece in regular time before Adelaide reeled off the last 10 points of the game to clinch the win 84-77. Anthony played 14 minutes, contributing 2pts/2rebs/1block but the star of the show was Boomer Brock Motum who rained in 27 points – 8/10FG and 9/9FT’s. Next up for the sixth placed 36ers is a visit from the Breakers on Sunday. In Townsville the Crocodiles held off the Sydney Kings to win an equally tight game 93-92. Henry was very busy off the bench for the Crocs – he only scored 2 points but pulled down a team high 6 rebounds and also added 2 steals and a block. The victory moves the seventh placed Crocs to 6-11 and keeps their slim play off hopes alive. Last but not least, late on New Years Eve in Oklahoma, the Thunder downed the Phoenix Suns 137-134 in overtime to improve their NBA record to 16-17. The scores were locked at 128-128 at the end of the fourth quarter but powered by 44 points from the returning Kevin Durant the Thunder squeezed home. Steven Adams was his usual solid self posting 9 points/7 rebounds/ 1 assist and 1 steal in 28 minutes court time. Most of our overseas Kiwi players are in action over the weekend so another edition of ‘Kiwis Abroad’ will be posted early next week.